For people interested in watching General Conference online, click here. The following is written for 2012, although most of it still holds. The 2016 twitter hashtag is #umcgc, although be warned that weeds and wheat grow very closely together. General Conference is the quadrennial (every four years) gathering of the United Methodist Church that makes decisions on behalf of the whole global church. 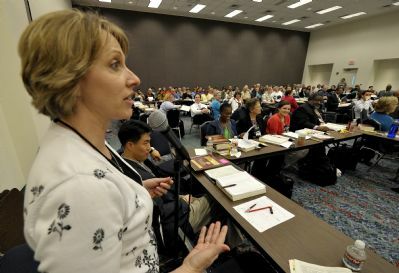 This year there will be nearly 1000 delegates from around the world who will be discussing issues like restructure, ordination, clergy health, the growth of the church outside of the U.S., justice issues, and the nature of our covenant as United Methodists. While we have very strong opinions about many of the issues facing General Conference, this blog is for communicating the day-to-day life of a delegate, page, and monitor. We will avoid expressing our personal opinions on the topics at hand although we may describe the challenges and debates. Judi blogged about her experiences at the 2008 General Conference here. This photo is copyright UMNS, but since it features Judi at GC’08, we’re posting it anyway! Head over to http://www.umc.org for more great coverage. Our analysis of the 2008 NEJ Conference is here.